It seems a LONG time since we talked about cancer and three whole months since the last scans. Geez, it was nice to have a break. Just so you know … cancer is always the elephant in the room. Sometimes it is the size of a mouse and sometimes a lot larger. When Rick’s ankles started swelling … a lot … conveniently right after our last visit with his oncologist, inside I panicked. We blamed it on a change in medication. Changed it … still large ankles. When we finally ditched the medication … after about six weeks … the ankles returned to normal. Found out he could live just fine without it. The elephant turned back into a mouse. Then in November, I thought it would be a great idea to walk in the 2017 MD Anderson’s Boot Walk. Rick woulda never made it in 2016. I loved how cancer survivors at the Boot Walk were given a “survivor” bandana. Rick wore it like an arm band. It was surreal walking with so many survivors, caregivers, friends and family that were touched harshly by the evil hand of cancer. I also noticed many walking in memory of those they lost. What a lovely tribute and a great way to raise money to fight cancer. Final numbers on the 2017 Boot Walk fundraiser … they reached a million dollars. Rick and I walked along with our awesome daughter, Katie, and grandsons, Jacob and Ben. The sign pinned on Jacob’s back read, “I am walking for my Pop-Pop.” And Ben, he slept the entire walk. So this week Rick had his three-month scans and blood work. Our visit with Dr. Campbell is always an adventure. We chatted about so many things besides blood work and scans. Rick is doing great. Everything is still stable and we head back in May! Then Dr. Campbell got out his magic marker and started writing across the tissue paper on the exam table. Geez, the last time he did this was to explain how immunotherapy works from a chemistry perspective. I looked at Rick to see if I should be worried. “I am telling all my patients three things,” Dr. Campbell started. In a peanut shell, he was frustrated with the state of Medicare. Lots of his cancer patients are on Medicare and having problems with receiving care. Apparently, Medicare has all these rules/laws that date from the 1980’s and it is his … and his colleagues … opinion that changes need to be made. Lots of articles in magazines, newspapers and other social media outlets are not having much of an impact in Washington. It was his thought perhaps there needs to also be a patient-driven mission to help make some important changes to Medicare. 1. Medicare has to be able to negotiate drug prices. Let’s face it. Cancer drugs are expensive. He also said the United States pays for 80-85% of the world’s drug costs. Other countries negotiate their drug prices and that is why they are so cheap compared to the United States. Something I never knew. Sounded reasonable to me. 2. Medicare patients should have the same access to care as commercial insurance with their co-pay programs. So I am guessing this is not happening. Why not? 3. Cancer patients should have the ability to participate in clinical trials. These important trials are saving so many lives. I’m living with one success story. I wondered if Rick would have been approved for the immunotherapy trial that saved his life had he not been insured by commercial insurance. Looks like I need to become more educated about how this works. Thoughts anyone? A cancer journey – new scan results! Last week Rick had his three-month scan extravaganza. It seems like years (it has only been 20 months) since I wheeled a very sick husband through MDA’s automatic doors. It is probably why before backing out of the driveway, I asked Rick if he still remembered his patient number. The seven-digit number is asked multiple times by MDA personnel before testing. Yep, like our social security numbers, these digits are forever embeded in both our brains. Rick just completed six months of observation without any medication. Previously, he had a couple of different types chemo pills which were a disaster. And before that months of immunotherapy. Testing and results this time around were going to be a very big deal. So on Friday there was a bone scan, bloodwork (I lovingly call “bloodletting”), CT and a mega-MRI scans. I highly recommend having scans on Friday. Everything went so smoothly, in about 6 a.m. and out by 4 p.m. That was probably the shortest scan day in our history. We were both pinching ourselves. We even had time to catch a quick bite to eat at the Rotary House’s restaurant between the CT and MRI scan. And today we received Rick’s stunning scan results from our favorite oncologist, Dr. Campbell. All the scans are the same as three months ago … stable. His lipase was even normal. 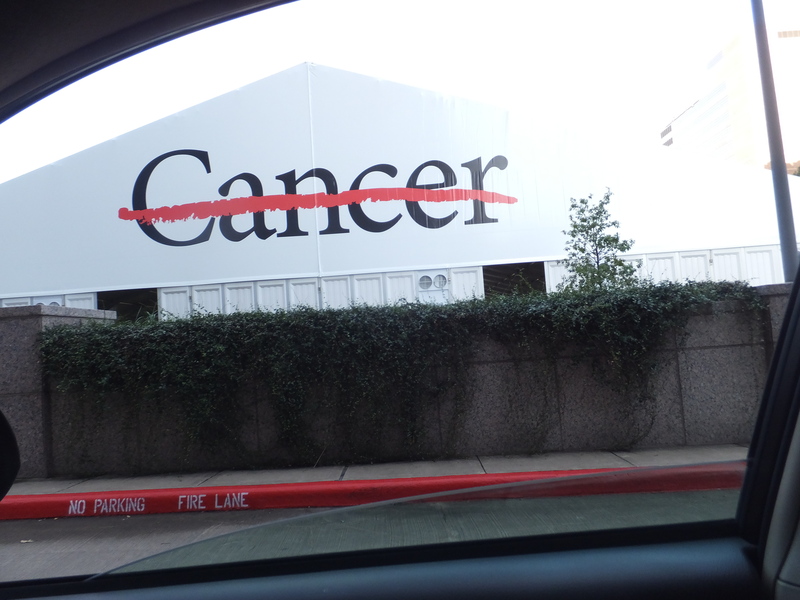 Thank you Jesus and MD Anderson. We talked a lot about the trial he had been on. The reflection was good for our soul. This immunotherapy stuff has only been around seriously since 2012. I think it all started with treating Melonoma patients. Rick started on his Immunotherapy Trial for Clear Cell Kidney Cancer in early 2016. Since then, his trial has expanded from 60 patients to 105. That is because patients were doing so well. Rick’s combination of two drugs have a 58% positive response rate. The one drug has a 42% positive response rate. Dr. Campbell indicated they will have all their slots full on the trial by the end of the year for the 105 patients. These positive results bode well for future Clear Cell Kidney Cancer patients. Dr. Campbell told us that they are expanding the types of cancers that receive immunotherapy ALL THE TIME. There are also new drugs being developed ALL THE TIME. He also said they have learned that some of the old drugs may not hold cancer at bay forever. Some of the drugs are doing very well. The good news is that patients, like Rick, who respond well to immunotherapy have a great chance that if cancer does return there will be lots more new treatment options to chose from. We go back for scans in three months. If that visit is stable … four month scans.